(Newser) – A farm in Albany, Oregon, is offering yoga classes with goats. Portland is probably mad it didn't think of it first. The Oregonian reports it all started when a yoga instructor asked if she could host a class on Lainey Morse's No Regrets Farm. Morse's six goats invited themselves to the class, and Goat Yoga was born. And if that sounds weird, consider that the Goat Yoga wait list is 500 people deep, according to the CBC. Morse says people are "just absolutely losing their minds" for it. She thinks her goats "add a level of happy and fun" to what is "supposed to be very strict meditation." 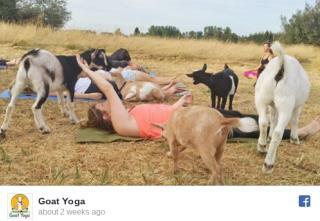 i love goats and i love yoga but lets keep them separated please. This is just another petting zoo...nothing more.